Poppa is home! I am so happy to be able to type that sentence. On Tuesday I wasn’t sure I’d ever be able to and on Thursday they began the discharge process. Poppa wanted to give the teams of specialists at Vanderbilt a challenge, I think, because he tested all of them: heart, lung, head, gastro, ortho, circulation, janitorial, nutrition, laundry, medical supplies, etc. It was a scary time but God is good, and while Poppa is tired and sore and weak, he’s sleeping in his own bed now. All the nurses loved him, by the way. He is a charmer even if he looks and feels like death. Do you know that that is? 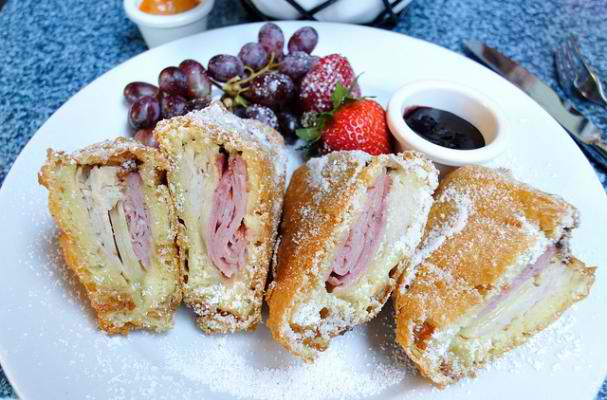 It’s a Monte Cristo which means it has the fat content of four sandwiches and that it has ham and turkey and lots of bread and two kinds cheese and then some more cheese and then some batter and then it is DEEP FRIED and then it has powdered sugar AND JAM. Are you kidding me? He ate it all. I had some grilled chicken and green beans and broccoli. And then I got bloated and he lost a pound. Brother Bear, I don’t even want to talk to you right now. Another update: Woney moved. Remember, she lived all the way across the country in CALlFORNIA while I live all way on the other side of the country in TENNESSEE and that makes gossiping with her face to face very difficult. However, Woney has now moved to MISSISSIPPI. Yes, I know. I don’t understand it either. The culture shock may kill her so we all need to think good thoughts for her as now she has to learn how to say “y’all” and “bless her heart” and also how to make tea with four cups of sugar per gallon. I really wanted to ask you guys to remember her in your prayers and whatnot before she left as she was driving across the country by herself but since she did it quicker than I was expecting, she’s already there. It won’t be long until she begins complaining of the heat and the humidity and I’ll feel compelled to buy her a box fan which I will totally do and then personally hand deliver it because now she is no longer a $400 plane ride away. Now I can go visit her on the weekends. Do you know how happy this makes me? Oh, we are going to get into so much trouble. I have some other requests for you. Loads of my friends are in transition now, so while you are lifting up Poppa and Woney, I’d also like for you to remember Lynnette, Freddie, Kindle, Quan and a new-to-you friend I shall call Happy. And then throw Madre on the list because life with Poppa will be a bit different now. Madre will take that on as she does everything else: fiercely and with great vigor, but still, transition is hard. As for me, I turned in my book proposal. Yay, me. I would be far more enthusiastic about that but my family and I just spent eight days being terrified and so it is enough for me to type all this up tonight. I really am proud and once I get my house in order and my laundry done, I’ll write with much more finesse and with many more exclamation points. Thanks, all, who were supportive in any way. Prayers, good thoughts, hugs, phone calls, offers of assistance, emails. Thank you for all of it. I’m proud to call you mine. I’m so happy to hear Poppa home and doing better! My love to Madre. I am so grateful Poppa has come home. I promise to help Madre in any way possible – through prayer & action. They are such very, very wonderful people & I am proud to be their neighbor!